When someone is thinking about refinancing an existing VA loan, there usually is more involved than just the interest rate attached to the note compared to where rates currently are. Yes, this is the most common reason someone refinances an existing VA mortgage, but there are other reasons as well. Or any other type of mortgage for that matter such as an FHA, USDA or a conventional loan using Fannie Mae or Freddie Mac guidelines. If rates have fallen lower than what a borrower currently has, then a refinance might make sense if the lower monthly payment saves enough money to offset the closing costs involved with the new loan. How long the homeowner has held the existing mortgage is also a consideration. If someone has a mortgage for several years and refinances to a new, lower rate, that also means the interest paid to date will be lost unless the new term is shorter than the old. And speaking of loan terms, that too can be a legitimate reason to refinance an existing mortgage. When we issue loan programs each and every day, besides different types of mortgages and different interest rates, loan terms can also be a choice. The longer the loan term, the lower the monthly payment will be. One of the primary reasons the 30 year mortgage is the most popular term when financing real estate is because it provides the lower monthly payment. On the flip side, the longer term means paying more interest over time. For those that care more about interest paid over time versus how high or how low the payment will be, a shorter term loan is the answer. Most loan programs offer loan terms in 10, 15, 20, 25 and 30 years. Someone with a 30 year mortgage that wants to match up their retirement date with paying off the mortgage might select a loan term that matches that time frame. VA loans are offered in both fixed and adjustable rate. 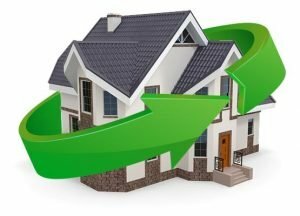 When a borrower has an adjustable rate loan and it looks like interest rates are on a gradual move upward, refinancing out of the adjustable rate into a fixed can also be a good idea. The key takeaway is that you should always regularly review your existing mortgage and your financial goals with your loan officer to make sure the mortgage you have matches up with your future plans. The VA loan program is perhaps the ideal choice for those that are eligible for the program and want to come to the closing table with as little cash as possible. This is because no down payment is needed and the buyers are restricted from paying certain types of closing costs. But there are other benefits long after the original loan was funded when refinancing is in play. The VA loan offers a “streamline” refinance option. Officially titled the Interest Rate Reduction Refinance Loan, or IRRRL, the streamline can replace an existing VA loan with a new VA loan as long as the monthly payments are lowered with the new rate or the goal is to refinance out of an adjustable rate mortgage into the stability of a fixed rate loan. With a streamlined refinance, there is very little documentation required and closing costs are minimal. There is no appraisal or credit report fee for a streamline refinance, for example. Most of the time there is no need to document income or employment documentation. Closing costs may also be included in the new loan. But that’s where it stops. Borrowers are not allowed to pull out any extra cash. Unless they apply for a VA cash out refinance. The VA cash-out refinance can provide homeowners with a new loan, closing costs rolled into the mortgage and give additional cash to the borrowers at the closing table. How much cash? VA guidelines allow for up to 100% of the current property value to be taken out as cash after the new mortgage has been placed. For example, if the property is appraised at $250,000 and the current principal and interest plus all closing costs is $200,000, the borrowers can get a new loan at $250,000 and put $50,000 in the bank. With the VA, this is perfectly okay as long as the borrowers can qualify based on income, credit, and employment. But you’ll notice a few differences with a VA cash-out refinance. With the 100% VA cash-out refinance, the “streamline” option is no longer there. That means the loan is fully documented with proper income and asset paperwork. A new appraisal will be ordered to see how much equity there is and a credit report will also be ordered and reviewed. Note, even though there will be more closing costs with a cash-out refinance compared to a VA streamline refinance. If pulling out cash is the primary motive for a borrower and the existing mortgage is still a good fit, then a home equity line of credit or HELOC or just an equity loan can meet that need. But if refinancing does make sense for any of the reasons listed then considering pulling a little extra cash out during the transaction might be a good option. Interest rates on VA loans are extremely competitive, especially so when comparing VA rates with other types of borrowing such as a home improvement loan or even putting home improvements on a credit card. Cash-out proceeds can be used for any purpose, there are no limitations those funds may be used for. The funds don’t have to be used for any specific home improvement or a remodel. They can be of course, but it’s not a requirement. Rates for VA loans can change daily and when the markets are somewhat volatile, rates can change even during the course of a single day. If you’re thinking of a VA cash-out loan, contact us by calling the number above or just submit the Info Request Form for expedited service.